We proudly present several, wonderfully detailed, Christian crosses. The Cross has such much meaning for the Christian faith. The Christian cross stands for the suffering that Jesus Christ did on the cross on behalf of the world. Our variety of crosses offer different styles, all with the same meaning. This mark of the Christian faith can be worn with pride. Each cross necklace comes packaged with a 24" chain. 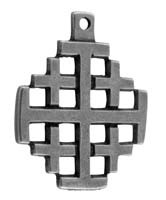 As with all our products, each pewter cross is made in our USA workshop. They are created with care and careful attention. You can expect to receive American made quality. The crosses make great gifts for the person who is celebrating faith milestones. Get one for yourself, or gift one of them as a congratulations to a person who has reached the next level of faith in their life. It will bring back the memories and be cherished for years, and years to come.